It's probably not escaped your notice, but there's been a bit of a heatwave here in Blighty. Yes: it's that time of year when we all want to head out to the beach, the woods, the hills … or to the kitchen, to get a cold drink from the fridge. it was fine in the end). Of course, days out just aren't the same without our furry friends in-tow, and we all like to share our fun time with them. On REALLY hot days, however, it's best to leave your pet indoors, where it's shaded and cool … you can get tips on how best to keep your pets cool in this blog post from last year. But, if you do have to take them, never, EVER leave your pet in a car. Many people still believe that it's fine to leave a dog, cat, or other pet, in a car on a warm day, as long as the windows are open, and the vehicle is parked in the shade. But don't be fooled: it's a highly dangerous situation for a dog, and other small animals, even in 'normal' temperatures. Modern automotive glass acts like greenhouse glass, trapping heat, and causing a rapid rise in temperature. With an external temperature of 22ºC, inside a car it can be 47ºC within the hour. On a hot day, opening the windows simply won't make enough of a difference. Dogs pant to cool down, but the hotter and more humid it is, the less effective this becomes, and eventually, a dog simply cannot cool himself. DEFRA (Department for Environment Food and Rural Affairs) warns that distress and suffering occurs for pets when temperatures go above 25ºC for more than a few minutes. Think you can wind down the window a crack, and pop into the shop for a few moments? Ten minutes is long enough for heat to cause soft tissue and brain damage in a dog … 10 minutes. With temperatures here in Dorset recently nearing 30ºC, you probably need to think about that for a moment. In this sort of heat, even less than ten minutes in a hot car could be enough to cause permanent brain damage in your dog, and eventual death. How would that make you feel? And it's not just cars. Caravans, campers, and mobile homes are prevalent on our roads at this time of year, and the temperature here can rise just as quickly. Heatstroke in dogs is particularly serious, but there are early warning signs to look for. One of the first, is heavy panting, barking, whining, and excessive salivation. Some dogs bark and whine more than others, of course, but even if you don't know the dog, you'll probably spot the signs of distress, even if he or she appears 'happy' to see you. In warmer temperatures, such symptoms may only show for a few minutes: glassy eyes, and unresponsiveness soon follow. By this time, cells have started to die, and seizures, coma, and death are likely to follow. There is no time to waste. There's a dog in there … smash the window! What if you do find a dog trapped in a hot car, and they are clearly distressed? Do you just smash the window? Force the door open? Well, the first thing to be aware of, is that only a Local Authority inspector or Police Constable have legal powers to enter a premises (including a vehicle) for the purpose of assisting an animal that is, or is likely to be, suffering. But, if Fido is fine, you'd best get a lawyer! Whilst the RSPCA may seem like the first organisation to contact, it may not be able to attend quickly enough to help. Plus, the RSPCA does not have powers of entry, so cannot get into a vehicle without the owner's permission … it be would committing a criminal offence. If you're in a public carpark, such as a supermarket or store, ask the Manager to make a call on the store's tannoy, and request the owner immediately attends and removes or checks on the dog. If the dog is already showing signs of distress, then the best thing to do is to dial 999 and report it to the local police. Calmly give as much information as you can: where you are, how long you've been aware of the pet in the car, whether the animal is responsive, showing signs of stress, etc, and the car details, along with any efforts you may have already made to contact the owner, or otherwise help. Once you've alerted the Police, call the RSPCA. Tell them that you've called the Police, and give them the same info. Let them know what the outcome of your 999 call was – what the Police are planning to do, or when they're likely to arrive at the scene. But it's going to be too late! If you can, try to ensure that a crowd doesn't gather around the car, and that voices – and tempers – are kept low and calm. If the owner returns, and they become agitated, try to stay calm: being argumentative only results in more stress for everyone … including the dog. Express your concern, engage them, and be as civil as you can. The Police will be able to handle everything when they arrive. If an animal has been removed from a vehicle, move him to a shaded area, and give him some water if you can. Soaking a chamois or t-shirt in water, and rubbing this over them can help to cool them, as can fanning them, or spraying a fine water mist over their coat. DO NOT GIVE ICE CUBES IN THIS SITUATION; this can cool them too quickly, leading to complications. Why are people allowed to do this?! They're not. Yes, it's true that there is no law that prohibits someone leaving a dog in a car, but there is a law against animal cruelty. 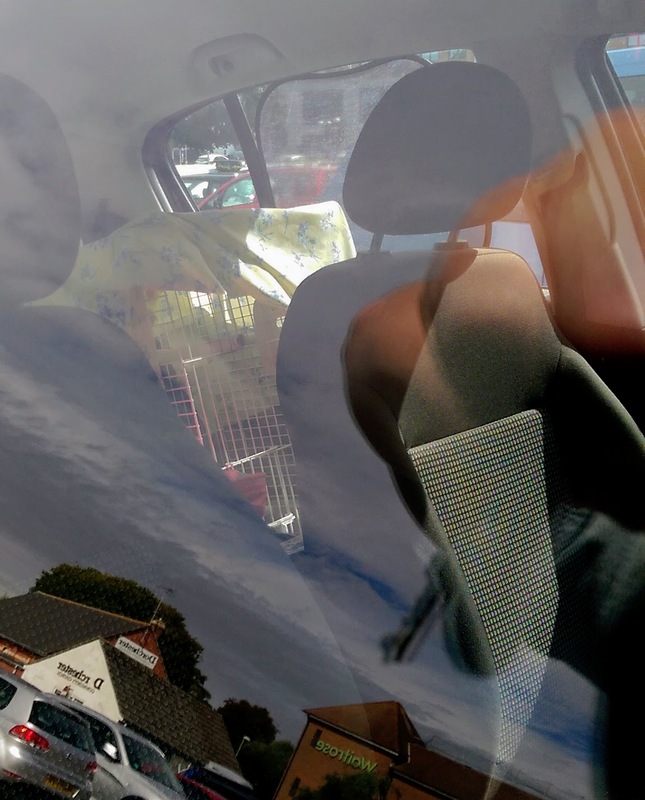 In the UK, under the Animal Welfare Act 2006, if an animal becomes ill or dies from being left in a hot car, the person responsible could face six months in custody, and a fine of up to £20,000. We hope you never need the above advice, but, should you come across an animal in distress in a vehicle, you know what to.